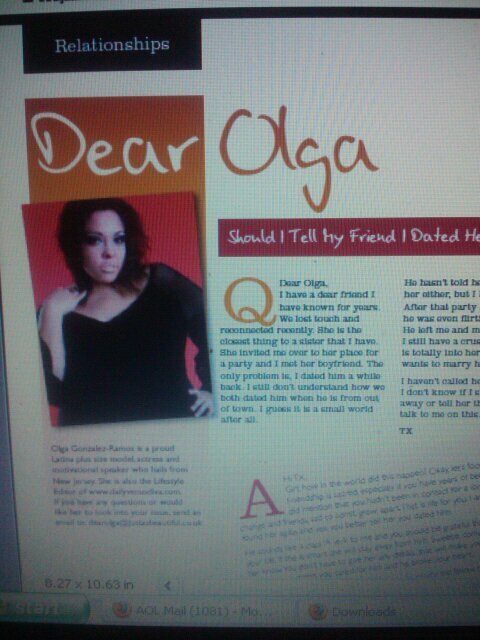 Dear Olga or Ask Olga as many like to call it is an advice column that fits every curvy girls need. It started when Olga was getting over 50 emails from Daily Venus Diva readers. She has found a way to share her story, joys and let downs in her life and in this industry. She is known by many as the heart and soul of the magazine. She gives detail feedback to each and every letter. Start reading..learn, cry, laugh and most important enjoy..
‘Dear Olga’ is also being celebrated in the #1 UK plus size lifestyle publication, ‘Just As Beautiful’ magazine. Every ‘Dear Olga’ being used is a different letter so you will never get to read the same thing twice providing her readers/fans with top advice fresh from the heart. Thank you so much…and guess what I would love to help you write this book! !